There’s been a unsettling rash of incidents in the media lately, centered on people dressing up in clown masks and lurking wherever they see fit. And while the “creepy clown craze” is probably as much a product of media mass hysteria as actual menace, so far it’s also led to arrests, school closures, and possibly even some deaths. (Plus the bizarre sight of a member of the Insane Clown Posse coming out as a voice of reason on clown-based matters in America.) It’s understandable, then, that McDonald’s—the country’s No. 1 purveyor of dead-eyed circus performers and quick, greasy food—might want to take steps to distance itself from this whole mess for a little while. 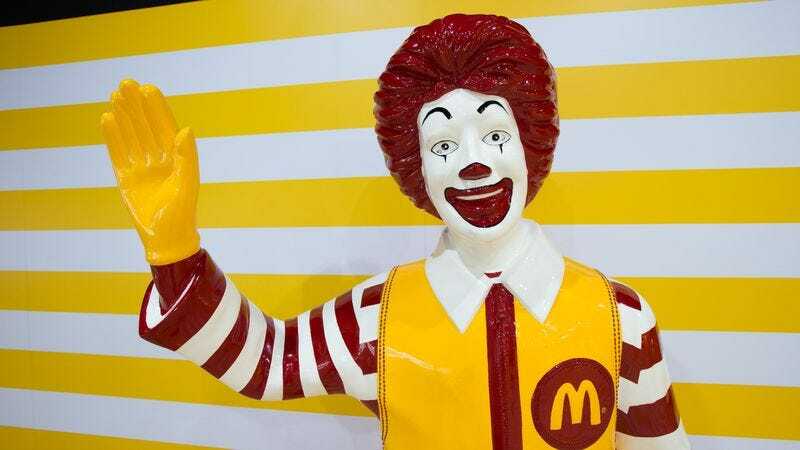 Citing “the current climate around clown sightings in communities,” the fast-food giant has announced that it intends to be “thoughtful in respect to Ronald McDonald’s participation in community events.” (In other words, Ronald’s getting benched until 20-year-olds in rubber masks stop lurking outside daycares for kicks.) McDonald’s didn’t make any further statements about who might step up to replace McDonald as the company’s promotional star; the Hamburglar, of course, is hampered by an extensive criminal record, while Grimace taps too hard into the American fear of smiling, slowly moving purple mountains.